The TERMIK®-Z-10 is excellent for drying high moisture content vegetables, fruit, spice plants, herbs and other crops (e.g. mushrooms, pumpkin seed, flowers, etc.). The properly prepared crops should be spread evenly in a 1 to 2 cm thick layer over the crates or trays. In case of a peak load, 120 pieces of plastic crates or 60 pieces of aluminium trays can be placed in the drier. Dehydration is carried out intermittently. One lot is dried within 5 to 24 hours. 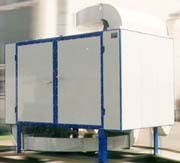 The drying temperature, the volume of the drying air and the direction of the air flow inside the drier can be adjusted to preference during the operation of the equipment. The performance parameters stipulated above are valid mainly for the dehydration of high moisture content vegetables, fruit, spice plants and herbs. In addition to the above, the equipment can be excellently used for drying other crops as well (such as mushrooms, pumpkin seed, flowers, etc. ).